THIS ARTICLE CONTAINS THE STATS, STRATEGY, AND GUIDE FOR AVENGER - JEANNE D'ARC (ALTER). WE WILL UPDATE THIS AS SOON AS THE GAME COMES OUT. Excels in striking Critical damage, she is considered as one of the highest attack stats among the 5 Star class servants. Despite of her massive ATK, her HP is lackluster. To mitigate this risk, be sure to use Ephemeral Dream wisely. Ephemeral Dream is a unique skill that grants a buff to Buster Card effectiveness and 1 turn of invincibility. Time it during a Buster Chain or get Noble Phantasm in the chain. Her NP gain is exceptional due to her capacity to deal multiple hits. 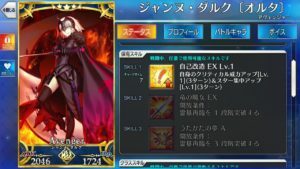 She can also chain decently alongside other servants as she possesses 2 Arts Cards from her pile. When you consider which Skill to reinforce first, it involves a toss between Dragon Witch and Self-Modification. If you carry allies that possess a Dragon attribute, Dragon Witch further strengthens them and becomes the more solid choice. On the other hand, you could make a case for fulfilling an all-offensive role and pursue Self-Modification to take advantage of her Avenger class. Gem Magecraft: Antumbra is a superior Craft Essence for taking advantage of Critical Damage bonus. If you do not have this CE, feel free to substitute Rin’s Pendant. Avenger B Decreases other party members’ debuf resistance by 8%. Increases NP Charge Rate when hit by 18%. Self-Replenishment (Magic) A+ Gain 4% NP Gauge per turn. Self-Modification EX 3 7 Increases own critical damage for 3 turns. Increases own critical star absorption for 3 turns. Dragon Witch EX 3 7 Increases the attack of all allies for 3 turns. Further increases the attack of all Dragon allies for 3 turns. Ephemeral Dream A 1 8 Increases own Buster card performance for 1 turn. Grants self invincibility for 1 turn. Deals 1000 damage to self (HP cannot fall below 1 from this skill). Deals damage to one enemy. Target cannot gain buffs for 1 time. Apply Curse for 5 turns. After she burned to death, Gilles De Rais went mad. He then made a wish to the Holy Grail to resurrect Jeanne D’ Arc only to have her become Jeanne D’ Arc Alter. Since the original Jeanne D’Arc is not considered as a hero herself, this alternate manifestation of her is not actually an Alter form but made only from de Rais’ desperation to revive Jeanne D’Arc.